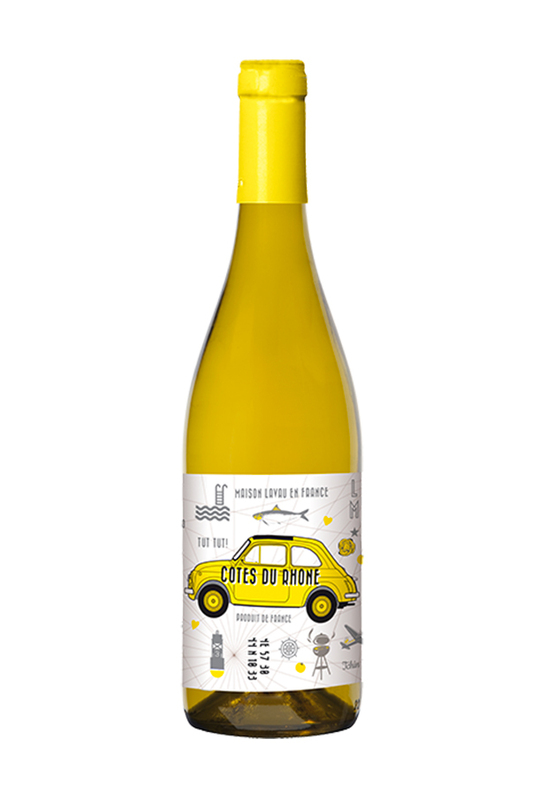 This wine comes from a selection of vineyards from across the southern Rhône Valley, extending from Montélimar to Nîmes..
After a light skin maceration, the grapes are pressed and placed in temperature-controlled stainless steel vats. Fermentation is carried out at low temperature to preserve as much fruit as possible. Ageing also takes place in vats, on the fine lees, with no malolactic fermentation taking place, in order to preserve the crisp, crunchy character of this easy-drinking wine. Serve between 12 and 14°C, not too cold, to enable the aromas to come through. Enjoy with a fish terrine, salmon tartare, seasoned fish or even a mid-dry goat’s cheese. This wine cornes from a selection of vineyards from across the southern Rhône Valley, extending from Montélimar to Nîmes. The grapes are pressed immediately upon arrivai in the winery, and the lightly tintedjuice is then vinifted like a white wine, at the same temperature (16-18°C). 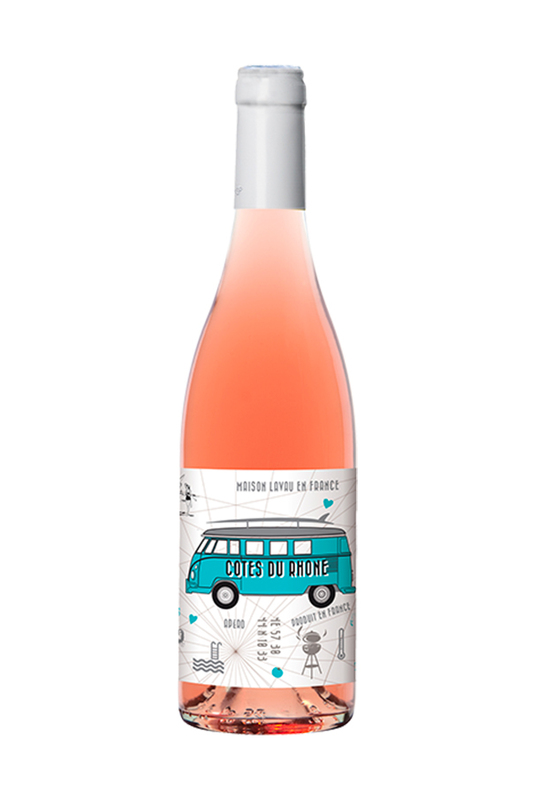 Malolactic fermentation is prevented in order to preserve the fresh, crisp character of this rosé. Ageing takes place in vat and the wine is bottled before spring. 10-12°C, well chilled especially in summer. As an aperitif, or paired with salmon mousse, salade niçoise or tapas. The Grenache and Syrah are planted in clay-limestone plains and cultivated to achieve yields of around 50 hl/ha. The grapes are entirely de-stemmed and placed in temperature-controlled vats to macerate for around 15 days with only pumping-over operations, after a cold pre-fermentation maceration. The wine is aged in vats until it is bottled 1 year later. 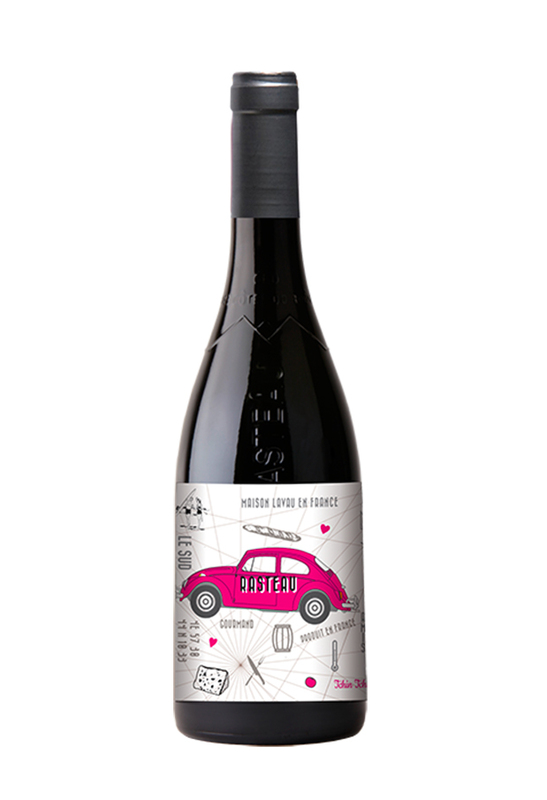 A lovely expression of blackcurrants and crushed raspberries on the nose, fresh and fruity on the palate. 16°C, slightly cooler than for the cru wines. Enjoy with a variety of dishes and grilled meats. 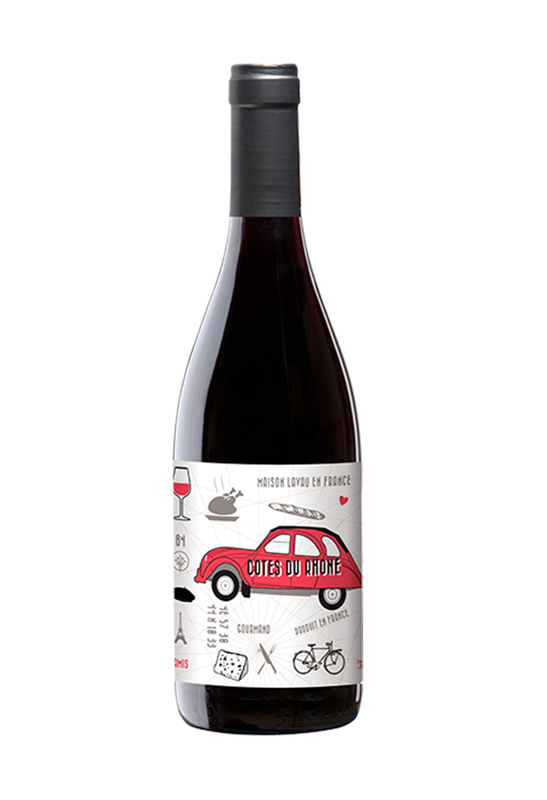 This wine cornes from a selection ofvineyards located in the hills of Ventoux, iconic mountain of Rhône Valley. The Grenache and Syrah are planted in clay-limestone hi lis and cu ltivated to achieve yields of around 50 hl/ha. The grapes are entirely de-stemmed and placed in temperature-controlled vats to macerate for around 15 days with only pumping-over operations, after a cold pre-fermentation maceration. The wine is aged in vats until it is bottled 1 year later. 16°C, slightly cooler thon for the cru wines. Our Rasteau appellation grapes corne from parcels located near the village, on east-facing, stony hillsides. The grapes are entirely de-stemmed and placed in temperature- controlled vats to macerate for around 25 days with rack-and-return operations at the start of fermentation, followed by two pumping-over operations per day. The wine is then transferred into barrels for 12 month ageing with half the vat’s content going into 450L barrels previously used for 1 or 2 vintages . A wine with strong Mediterranean accents, both in terms of its aromas of garrigue scrubland, spice and ripe fruit on the nose, and in terms of its power and intensity on the palote. A generous yet well-balanced wine with long-lingering aromas. 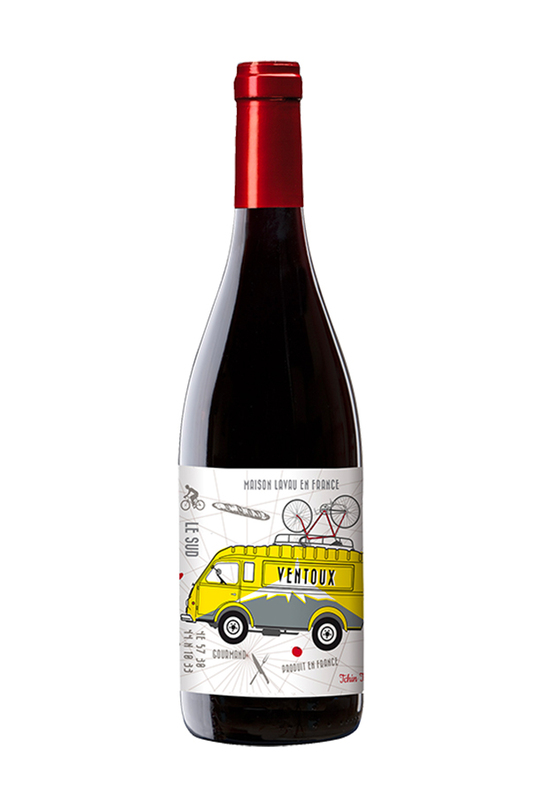 This wine cornes from parcels located to the north of the prestigious Châteauneuf-du-Pape Appellation. This wine cornes from directly west-facing parcels located on the plain of Vacqueyras. The grapes are entirely de-stemmed and placed in temperature controlled vats for around 24 days with two rack-and-return operations at the start of fermentation, followed by two pumping-over operations per day. 60% of the wine is aged in vat, and 40% in 450L barrels previously used for 1 or 2 vintages, for a period of 12 months, befor being blended with the vat-aged wine. Serve at 17-18°C to allow the wine to express its ( ???? ) full complexity. Decanting is not necessary and the wine expresses itself in ???? ???? the glass immediately after opening. ldeal with a rib of beef, or paired with ???? an entrecôte steak with herb butter .. This wine cornes from parcels located on Gigondas’ terraced slopes, facing directly north, at the foot of the famous Dentelles de Montmirail. The old Grenache, Syrah and Mourvèdre vines are planted on fairly poor, calcareous-marl soils, resulting in lote ripening grapes and powerful wines. The grapes are entirely de-stemmed and placed in temperature- controlled vats to macerate for a round 28 days with two rack-and-return operations at the start of fermentation, followed by two pumping-over operations per day. 55% of the wine is aged in vat, and 45% in 45OL barrels previously used for 1 or 2 vintages, for a period of 12 months, before being blended with the vat-aged wine. Deep on the nose with pronounced spicy aromas (pepper, nutmeg), typical of the appellation and which accentuate the aromas of blackcurrants and raspberry jam. On the palote, the wine shows a solid yet nicely coated structure, volume and superb length. Serve at 17-18°C to allow the wine to express its full complexity. Decanting before serving would also be beneftcial. This Gigondas can be paired with guinea fowl, coq au vin, a beef stew or casserole, and other prepared dishes, even if spicy or highly seasoned.duck in green pepper, guinea fowl or pheasant, and will be at home with any festive fore. The grapes are entirely de-stemmed and placed in temperature- controlled vats to macerate for a round 30 days with two rack-and-return operations at the start of fermentation, followed by two pumping-over operations per day. 50% of the wine is aged in vat, and 50% in 450L barrels previously used for 1 or 2 vintages, for a period of 12 months, before being blended with the vat-aged wine. Complex nose of plu ms and black cherries with a hint of cocoa and cloves. 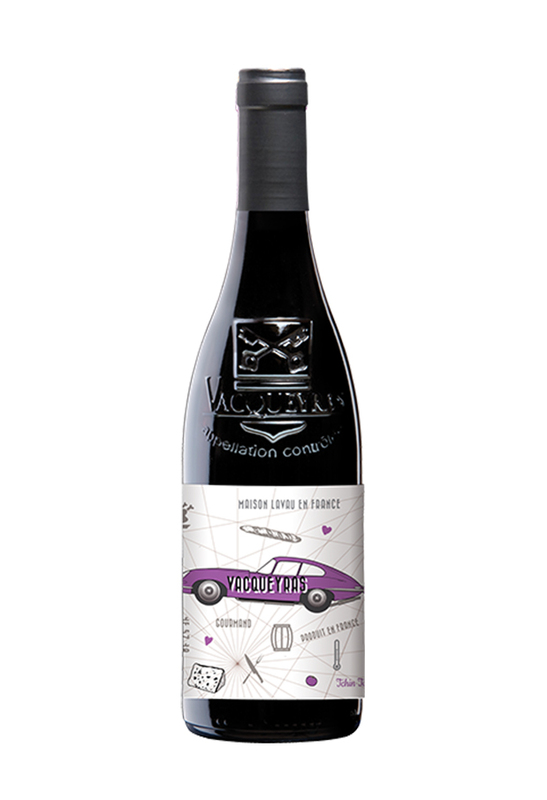 Full and well-balanced on the palate, showing extreme finesse and remarkable length.